It’s better than a boat. It’s better than a jet ski. Now you can fly above the water on the Aqua Skipper! With your feet on the platform and your hands on the handles, simply hop up and down to propel yourself forward. The hydrofoils lift the Aqua Skipper above the water, allowing you to move much faster than any other human-powered watercraft. Made with aircraft aluminum and fiberglass. With the Aqua Skipper, you can ride on waves, race your friends, and even try new tricks! 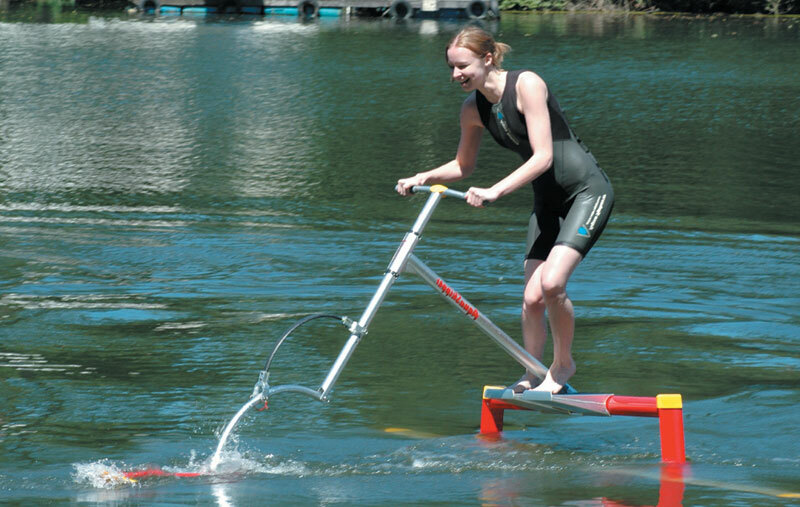 Any way you use it, the Aqua Skipper is both a lot of fun and a great way to exercise. Aqua Skipper is a product of Inventist, USA. The image above shows the AquaSkipper during the downward portion of the jump. The force of the jumping pushes down on the back foil and compresses the spring. 1. What happens if I stop hopping? You’ll end up in the water – not a bad idea on a hot and sunny day! To keep your and the AquaSkipper up and out of the water, simply hop along on the platform or ride a wave. You can also glide for short amounts of time, but then you’ll need to start hopping again. 2. Can I start in the water? The AquaSkipper can only be started from above the water’s surface, such as from a dock or boat. It doesn’t take long to master riding the AquaSkipper. Once you do, you won’t end up in the water… unless you want to. 3. What are the minimum and maximum speeds? To keep the AquaSkipper above the water, you’ll need to go at least 5 mph. The average cruising speed in 8-10 mph. The maximum speed is 17 mph. Dare to break the world record? 4. Are there weight restrictions? The minimum weight is around 70 pounds. The maximum is approximately 250 pounds. 5. Is it easy to assemble the AquaSkipper? How small does it fold down? The AquaSkipper can be put together and taken apart in about five minutes. When disassembled, stow it in the optional carrier that’s around the size of a golf bag.